Publishing data, insights and business capabilities via API in a unified way can be challenging at times. Azure API management (APIM) makes it simpler than ever. These days, it’s very common to have many distributed services (let’s say Micro service) publish APIs in a mesh up Azure API management portal. For instance, Order and Invoice APIs are published over an E-Commerce API portal, although they are backed by isolated Order and Invoice Micro services. Autonomous teams build these APIs, often work in isolation’s but their API specifications (mostly Open API specification / Swagger documents) must be published through a shared API management Service. Different teams with different release cadence can make the continuous deployment of API portal challenging and error prone. Azure API management ships bunch of Power Shell cmdlets (i.e. 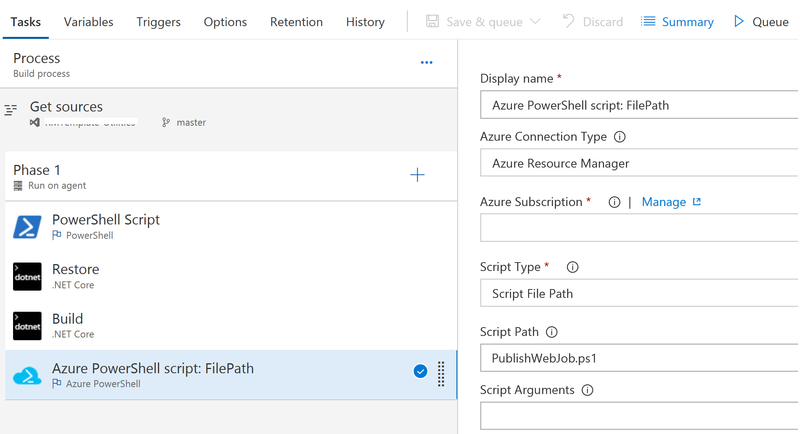 Import-AzureRmApiManagementApi and Publish-AzureRmApiManagementTenantGitConfiguration ) that allow deploying the API documentation directly to APIM. Which works great for single API development team. It gets a bit trickier when multiple teams are pushing changes to a specific APIM instance like the example above. Every team needs to have deployment credentials in their own release pipelines – which might undesirable for a Shared APIM instance. Centrally governing these changes becomes difficult. APIM instance has a pretty neat feature. Each APIM instance has a configuration database associated as a Git Repository, containing the metadata and configuration information for the APIM instance. We can clone the configuration repository and push changes back- using our very familiar Git commands and tool sets and APIM allows us to publish those changes that are pushed – sweet! This allows us downloading different versions of our APIM configuration state. Managing bulk APIM configurations (this includes, API specifications, Products, Groups, Policies and branding styles etc.) in one central repository with very familiar Git tools, is super convenient. The following diagram shows an overview of the different ways to configure your API Management service instance. This sounds great! However, we will leverage this capability and make it even nicer, where multiple teams can develop their API’s without depending on others release schedules and we can have a central release pipeline that publishes the changes from multiple API services. The idea is pretty straight forward. Each team develop their owner API specification and when they want to release, they create PR (Pull Request) to a shared Repository. Which contains the APIM configuration clone. Once peer reviewed the PR and merged, the release pipeline kicks in. Which deploys the changes to Azure APIM. We will provision a APIM instance on Azure. We can do that with an ARM template (We will not go into the details of that, you can use this GitHub template ). We will sync it and clone a copy of the configuration database in our local machine using the following Power Shell script. (You need to run Login-AzureRMAccount in Power Shell console, if you are not already logged in to Azure). Write-Output "Syncing Git Repo with current API management state..."
This will make the Git Repository synced. Remove-Item $TempDirectory -Force -Recurse -ErrorAction "Stop"
Now, we have a copy of the Git in our local machine. This is just a mirror of our APIM configuration database. We will create a repository in our Source Control (I am using VSTS). This will be our Shared APIM source repository. Every team will issue Pull Request with their API Specification into this repository. Which can be approved by other peers and eventually merged to master branch. Sync the configuration database to APIM Git Repository. Clone the latest changes to our Build agent. Copy all updated API specifications, approved and merged to our VSTS repository’s master branch to the cloned repository. Commit all changes to the cloned repository. Push changes from clone repository to origin. Publish changes from Git Repository to APIM instance. The Git Repository model for deploying API specifications to a single APIM instance makes it extremely easy to manage. Despite the fact, we could have done this with Power Shell alone. But in multiple team scenario that gets messy pretty quick. Having a centrally leading Git Repository as release gateway (and the only way to make any changes to APIM instance) reduces the complexity to minimum. Azure Data Lake Analytics is an on-demand analytics job service that allows writing queries to transform data and grab insights efficiently. The analytics service can handle jobs of any scale instantly by setting the dial for how much power you need. A bit of research on Google revealed, it’s a system error, which doesn’t leave a lot of diagnostic clue to reason out. Retrying this job manually (by button clicking on portal) yielded success! Which makes it a bit unpredictable and uncertain. However, uncertainty like this is sort of norm while developing Software for Cloud. We all read/heard about Chaos Monkeys of Netflix. Today I will present an approach that mitigated this abrupt job failure. Basically, I wanted to have a job progress watcher, waiting to see a failed job and then resubmit that job as a retry-logic. Also, don’t want to retry more than once, which has potential to repeat a forever-failure loop. I can have my watcher running at a frequency – like every 5 minutes or so. Azure Functions continuously impressing me for its lightweight built and consumption-based pricing model. Functions can run with different triggers, among them time schedule trigger- that perfectly fits my purpose. The function app needs to retrieve failed ADLA jobs and resubmit them as needed. This can be achieved with the Microsoft.Azure.Management.DataLake.Analytics, Version=3.0.0.0 NuGet package. We will also require Microsoft.Rest. ClientRuntime.Azure.Authentication, Version=2.0.0.0 NuGet package for Access Token retrievals. We need a Service Principal to be able to interact with ADLA instance on Azure. Managed Service Identity (written about it before) can also be used to make it secret less. However, in this example I will use Service Principal to keep it easier to understand. Once we have our Service Principal, we need to configure them in Function Application Settings. That’s our Azure Function scheduled to be run every 2 hours. Once we get a trigger, we retrieve the AD tenant ID, Service Principal ID, secret and the account name of target ADLA. Next thing we do, write a method that will give us a ADLA REST client – authenticated with Azure AD, ready to make a call to ADLA account. The DataLakeAnalyticsJobManagementClient class comes from Microsoft.Azure.Management.DataLake.Analytics, Version=3.0.0.0 NuGet package that we have already installed into our project. We have now the capability to retrieve failed jobs, great! Now we should write the real logic that will check for failed jobs that never been retried and resubmit them. // If it's a retry attempt we will not kick this off again. // Before we kick this off again, let's check if we already have retried this before..
We can’t avoid failures, but we can respond in ways that will keep our system up or at least minimize downtime. In this example, when one Job fails unpredictably, its effects can cause the system to fail. We should build our own mitigation against these uncertain factors – with automation. Azure Web App allows us to configure IP Restrictions (same goes for Azure Functions, API apps) . This allows us to define a priority ordered allow/deny list of IP addresses as access rules for our app. The allow list can include IPv4 and IPv6 addresses. However, sometimes it’s handy to do this in Power Shell scripts – that can be executed as a Build/Release task in CI/CD pipeline or other environments – when we can add IP restrictions with some scripts and/or remove some restriction rules. Google finds quite some blog posts that show how to add IP restrictions, but not a lot for removing a restriction. "$IPAddress is already restricted in $WebAppName." Write-Output "New restricted IP address $IPAddress has been added to WebApp $WebAppName"
Write-Output "$WebAppName has no IP restrictions." Write-Output "$WebAppName IP Restrictions: "
Write-Output "Please login to your Azure account"
Get-AzureRmWebAppIPRestrictions -WebAppName "my-app" -ResourceGroupName "my-rg-name"
Remove-AzureRmWebAppIPRestrictions -WebAppName "my-app" -ResourceGroupName "my-rg-name"
Set-AzureRmWebAppIPRestrictions -WebAppName "my-app" -ResourceGroupName "my-rg-name"  -IPAddress "192.51.100.0/24" -Mask ""
Committing the secrets along with application codes to a repository is one of the most commonly made mistakes by many developers. This can get nasty when an application is developed for Cloud deployment. You probably have read the story of checking in AWS S3 secrets to GitHub. The developer corrected the mistake in 5 mins, but still received a hefty invoice because of bots that crawl open source sites, looking for secrets. There are many tools that can scan codes for potential secret leakages, they can be embedded in CI/CD pipeline. These tools do a great job in finding out deliberate or unintentional commits that contains secrets before they get merged to a release/master branch. However, they are not absolutely protecting all potential secrets leaks. Developers still need to be carefully review their codes on every commits. Azure Managed Service Instance (MSI) can address this problem in a very neat way. MSI has the potential to design application that are secret-less. There is no need to have any secrets (specially secrets for database connection strings, storage keys etc.) at all application codes. Let’s recall how we were doing secret management yesterday. Simplicity’s sake, we have a web application that is backed by a SQL server. This means, we almost certainly have a configuration key (SQL Connection String) in our configuration file. If we have storage accounts, we might have the Shared Access Signature (aka SAS token) in our config file. As we see, we’re adding secrets one after another in our configuration file – in plain text format. We need now, credential scanner tasks in our pipelines, having some local configuration files in place (for local developments) and we need to mitigate the mistakes of checking in secrets to repository. Azure Key Vault can simplify these above a lot, and make things much cleaner. We can store the secrets in a Key Vault and in CI/CD pipeline, we can get them from vault and write them in configuration files, just before we publish the application code into the cloud infrastructure. VSTS build and release pipeline have a concept of Library, that can be linked with Key vault secrets, designed just to do that. The configuration file in this case should have some sort of String Placeholders that will be replaced with secrets during CD execution. The above works great, but you still have a configuration file with all the placeholders for secrets (when you have multiple services that has secrets) – which makes it difficult to manage for local development and cloud developments. An improvement can be keep all the secrets in Key Vault, and let the application load those secrets runtime (during the startup event) directly from the Key vault. This is way easier to manage and also pretty clean solution. The local environment can use a different key vault than production, the configuration logic becomes extremely simpler and the configuration file now have only one secret. That’s a Service Principal secret – which can be used to talk to the key vault during startup. So we get all the secrets stored in a vault and exactly one secret in our configuration file – nice! But if we accidentally commit this very single secret, all other secrets in vault are also compromised. What we can do to make this more secure? Let’s recap our knowledge about service principals before we draw the solution. A resource that is secured by Azure AD tenant, can only be accessed by a security principal. A user is granted access to a AD resource on his security principal, known as User Principal. When a service (a piece of software code) wants to access a secure resource, it needs to use a security principal of a Azure AD Application Object. We call them Service Principal. You can think of Service Principals as an instance of an Azure AD Application. A service principal has a secret, often referred as Client Secret. This can be analogous to the password of a user principal. The Service Principal ID (often known as Application ID or Client ID) and Client Secret together can authenticate an application to Azure AD for a secure resource access. In our earlier example, we needed to keep this client secret (the only secret) in our configuration file, to gain access to the Key vault. Client secrets have expiration period that up to the application developers to renew to keep things more secure. In a large solution this can easily turn into a difficult job to keep all the service principal secrets renewed with short expiration time. Managed Service Identity is explained in Microsoft Documents in details. In layman’s term, MSI literally is a Service Principal, created directly by Azure and it’s client secret is stored and rotated by Azure as well. Therefore it is “managed”. If we create a Azure web app and turn on Manage Service Identity on it (which is just a toggle switch) – Azure will provision an Application Object in AD (Azure Active Directory for the tenant) and create a Service Principal for it and store the client secret somewhere – that we don’t care. This MSI now represents the web application identity in Azure AD. Going back to our key vault example, with MSI we can now eliminate the client secret of Service Principal from our application code. But wait! We used to read keys/secrets from Key vault during the application startup, and we needed that client secret for that. How we are going to talk to Key vault now without the secret? Azure provides couple of environment variables for app services that has MSI enabled. The first one is a URL that our application can make a request to, with the MSI_SECRET as parameter and the response will be a access token that will let us talk to the key vault. This sounds a bit complex, but fortunately we don’t need to do that by hand. Microsoft.Azure.Services.AppAuthentication library for .NET wraps these complexities for us and provides an easy API to get the access token returned. We need to add references to the Microsoft.Azure.Services.AppAuthentication and Microsoft.Azure.KeyVault NuGet packages to our application. This is neat, agree? We now have our application configuration file that has no secrets or keys whatsoever. Isn’t it cool? We have managed deploying our web application with zero secret above. However, we still have secrets for SQL database, storage accounts etc. in our key vault, we just don’t have to put them in our configuration files. But they are still there and loaded in startup event of our web application. This is a great improvement, of course. But MSI allows us to take this even better stage. To leverage MSI’s full potentials we should use Azure AD authentication (RBAC controls). For instance, we have been using Shared Access Signatures or SQL connection strings to communicate Azure Storage/Service Bus and SQL servers. With AD authentication, we will use a security principal that has a role assignment with Azure RBAC. Azure gradually enabling AD authentication for resources. As of today (time of writing this blog) the following services/resources supports AD authentication with Managed Service Identity. Read more updated info here. AD authentication finally allows us to completely remove those secrets from Key vaults and directly access to the storage account, Data lake stores, SQL servers with MSI tokens. Let’s see some examples to understand this. Once we have enabled the managed service identity for this web app, Azure provisioned an identity (an AD Application object and a Service Principal for it) with the same name as the web application, i.e. contoso-msi-web-app. Now we need to set role assignment for this Service Principal so that it can access to the storage account. We can do that in Azure Portal. Go to the Azure Portal IAM blade (the access control page) and add a role for this principal to the storage account. Of course, you can also do that with Power-Shell. You can run these commands in CD pipeline with Azure Inline Power Shell tasks in VSTS release pipelines. Let’s write a MSI token helper class. We will use the Token Helper in a Storage Account helper class. Now, let’s write a message into the Storage Queue. As of now, Azure SQL Database does not support creating logins or users from service principals created from Managed Service Identity. Fortunately, we have workaround. We can add the MSI principal an AAD group as member, and then grant access to the group to the database. Again, we are using the MSI id as member id parameter here. Let’s write a token helper class for SQL as we did before for storage queue. Managed Service Identity is awesome and powerful, it really drives application where security of the application are easy to manage over longer period. Specially when you have lots of applications you end up with huge number of service principals. Managing their secrets over time, keeping track of their expiration is a nightmare. Managed Service makes it so beautiful! 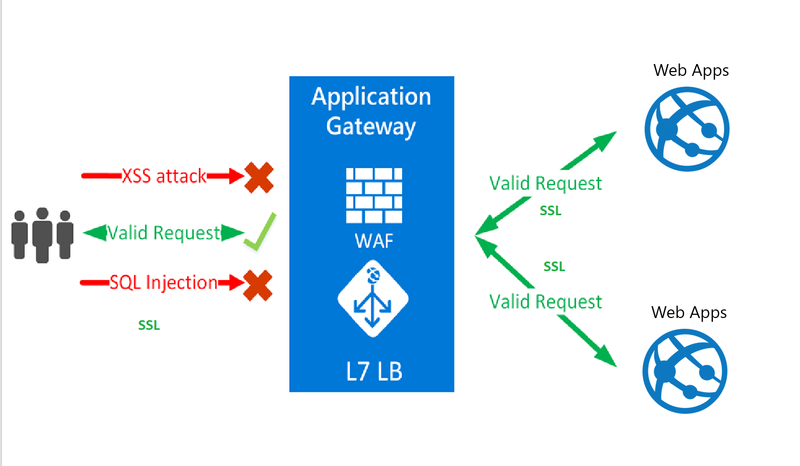 In order to met higher compliance demands and often as security best practices, we want to put an Azure web site behind an Web Application Firewall (aka WAF). The WAF provides known malicious security attack vectors mitigation’s defined in OWASP top 10 security vulnerabilities. Azure Application Gateway is a layer 7 load balancer that provides WAF out of the box. However, restricting a Web App access with Application Gateway is not trivial. To achieve the best isolation and hence protection, we can provision Azure Application Service Environment (aka ASE) and put all the web apps inside the virtual network of the ASE. The is by far the most secure way to lock down a web application and other Azure resources from internet access. But ASE deployment has some other consequences, it is costly, and also, because the web apps are totally isolated and sitting in a private VNET, dev-team needs to adopt a unusual deployment pipeline to continuously deploy changes into the web apps. Which is not an ideal solution for many scenarios. 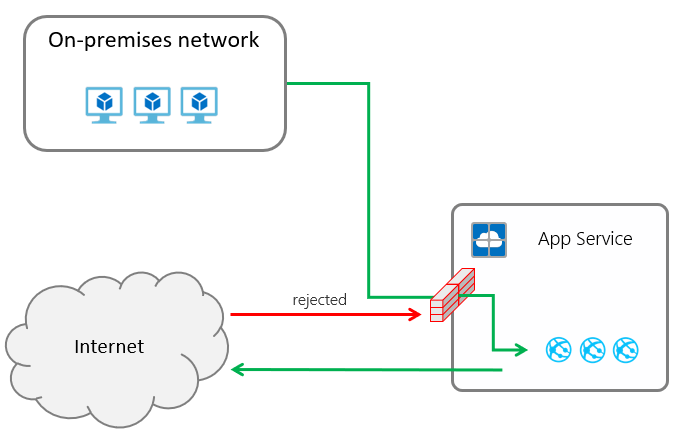 The idea is to provision an Application Gateway inside a virtual network and configure it as a reverse proxy to the Azure web app. This means, the web app should never receive traffics directly, but only through the gateway. The Gateway needs to configure with the custom domain and SSL certificates. Once a request receives, the gateway then off-load the SSL and create another SSL to the back-end web apps configured into a back-end pool. For a development purpose, the back-end apps can use the Azure wildcard certificates (*.azurewebsites.net) but for production scenarios, it’s recommended to use a custom certificate. To make sure, no direct traffic gets through the azure web apps, we also need to white-list the gateway IP address into the web apps. This will block every requests except the ones coming through the gateway. Virtual network (Application Gateway needs a Virtual network). Subnet for the Application Gateway into the virtual network. Public IP address for the Application Gateway. An Application Gateway that pre-configured to protect any Azure Web site. SSL certificate to configure the Front-End listeners. (This is the Gateway Certificate which will be approached by the end-users (browsers basically) of your apps). Typically a Personal Information Exchange (aka pfx) file. The password of the pfx file. SSL certificate that used to protect the Azure web sites, typically a *.cer file. This can be the *.azurewebsites.net for development purpose. Here, frontendCertificateData needs to be Base64 encoded content of your pfx file. This will provision the Application Gatway in your resource group. The final piece of work that you need to do, is to whitelist the IP address of the Application Gatway into your Azure Web App. This is to make sure, nobody can manage a direct access to your Azure web app, unless they come through the gateway only.